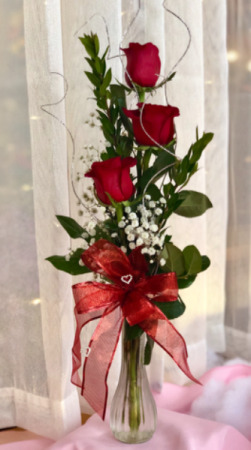 Three beautiful red roses arranged in a vase with greens and babies breath. Glittery Ting Ting and Two Rhinestone Heats. 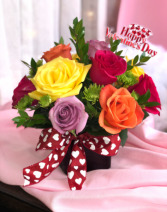 One dozen roses in shades of yellow, hot pink, orange and lavender with a touch of lime green pomps in a glass cube finished with a Valentine’s Day pick and bow. 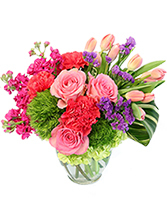 Container color and ribbon may vary. 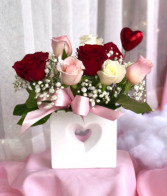 One dozen roses in a mixture of pinks, reds and whites with babies breath in a pretty ceramic container with a heart cutout. Bow and Valentine’s Day pick may vary.